Navigation Let's Meet Contact Work with Me! The other day while casually scrolling through my newsfeed on Facebook, I came across an article from the Boston Globe featuring a pop-up shop event happening soon. I am a person who loves the concept of a pop-up event, but also someone who almost never hears about one in time to visit. This time around though, the event found ME. Hourglass Boston, described on the site as a concept store that is both a boutique and content studio, was started by Project Runway winner, Erin Robertson, and product designer, Nicole Fichera. As explained to me by a nice gentleman in trendy glasses, Hourglass is meant to not only be a retail space but one for Boston artists and creatives to come in and use as their own studio with props, photo backgrounds, and helpful workshops. Hourglass is meant to inspire. And honestly, the moment I walked into the store (just a short walk from Kenmore), I couldn't help BUT feel inspired. This studio is very millennial-forward, designed specifically to be featured on Instagram. I was tentative at first to take pictures, conditioned by the many times employees in other stores have insisted that pictures were strictly prohibited. But at Hourglass, photos are not only allowed but encouraged. 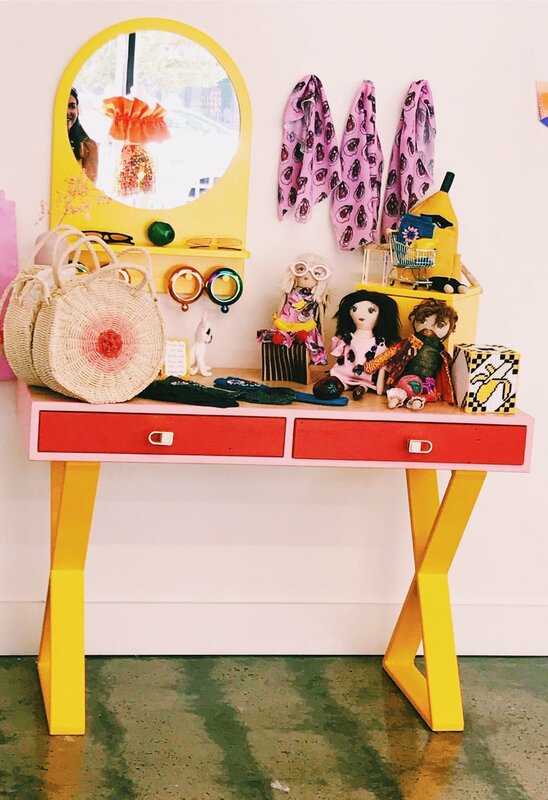 Fun and kitschy props can be found everywhere, and there's even a spectacularly hot pink backdrop for photo shoots. Since this is also a retail space for both Erin and Nicole's creations, let's take a moment to talk about it. 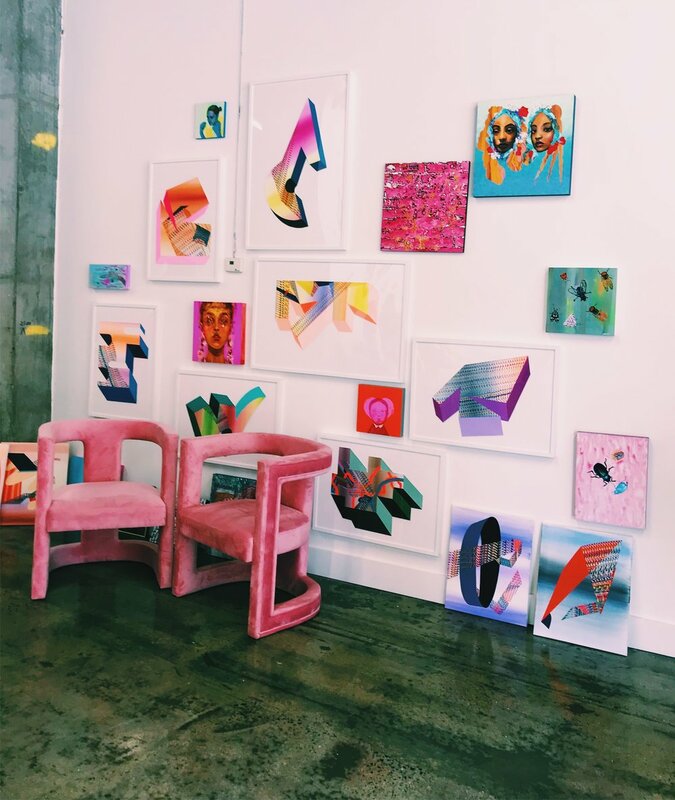 Neither Erin nor Nicole are afraid to work with color; it's absolutely everywhere. Erin's wild, vibrant, fun, and lively clothing design style meshes perfectly with the quirkiness and whimsy of Nicole's chic upcycled pieces. Speaking of Erin and Nicole, both women were around, greeting everyone warmly, explaining their vision for Hourglass and how it came to be, and taking fan pictures in front of their pieces. While everyone was encouraged to try on clothes, there was absolutely no pressure to buy. Hourglass is a store that sells items celebrating the bubbliness of life. From oversized ruffled crop tops to flowers made of sequins, to geometric, neon-colored plastic earrings, and upcycled porcelain teacups with profanities written on them as colorful as the floral pattern surrounding them, everything featured at Hourglass, while not always conventionally practical, is meant to remind you to incorporate a little fun in your life. My only gripe with the store, and it's a little one, is that I never found anything small but tangible to buy like a postcard or even a small $5 or $10 canvas tote with the Hourglass logo to carry around. Pop-up shops by nature are fleeting, so it would've been cool to have little pieces of memorabilia to keep. Since I'd just come from admiring the "French Pastels" and "Cassanova's Europe" exhibits at the Museum of Fine Arts, Boston, I was in the perfect head-space to appreciate Hourglass for exactly what it is: an expression of artistry. Erin and Nicole are both artists first, and sellers second. We are part of the Maker Generation, and Hourglass is the perfect product of that. Hourglass Boston is open now through late September 2018 at 1327 Boylston Street, Boston, MA 02115, Wednesday-Sunday 11am-7pm. When I was little and we would go to visit my grandparents in Nashville, I was always excited to play in my grandmother's perfumes. The room I stayed in was the room where she kept her clothes, shoes, and make-up (the perks of being empty-nesters: you can turn a bedroom into a giant closet). She had this mirrored tray that was absolutely crammed with perfume bottles that ranged in age from brand new to what had to have been decades old. Some were sprays, some were roll-on pens, and some even had an atomizer attached. I used to play with them for hours, considering the person I could be based on how I smelled. For me, smelling good was one step to being a real lady, like my mother, like my grandmothers. Scent has always been important to me. As I've grown in age, so too have my tastes. It feels like just yesterday I was spritzing myself with half a bottle of fruity mists from Bath and Body Works before standing awkwardly in a circle at a middle school dance. Then I became a teenager, right as the height of Paris Hilton's fame, and found myself smelling just like an "Heiress". In college it was cool to smell a little expensive, so I scrounged together the money to smell like the Marc Jacobs and Juicy Couture versions of myself ("Daisy" and "Viva La Juicy" respectively). But nothing has ever really stuck. And maybe nothing really should. I've always thought that the beauty of perfumes is that you can smell whichever way you want, depending on your mood. Variety, as they say, is the spice of life. What's not the spice of life? The price of some of these perfumes! A person can easily spend almost $200 dollars on some of today's hottest and most popular scents, and how long do those bottles last? A couple months? I consider myself a woman who is bubbly, but also on a budget. As if by magic, Target heard my pleas to continue to be the indecisive scented butterfly that I am, and created a perfume line that is so vast, so delicious-smelling, and most importantly, so affordable that my little heart can barely take it. With four collections to choose from, with prices ranging from $9.99 to $24.99, I have not-so-distant plans to try them all. My room's going to be like a department store fragrance counter, only better, because all my books, snacks, and jammies are here, too. The packaging for each bottle is beautiful, and so equally matches the scent. Not only does everything smell good, there was conscious thought behind product design as well. There's a scent for everyone. Are you a fan of a fruity scent like strawberry or apricot? Covered. Do you often find yourself in need of a floral scent? You got it. Do you consider yourself a "Queen Bee" or "Daydreamer"? Good Chemistry has even created scents based on powerful personalities. And if you're in search of a more masculine smell, you're in luck: the good smell scientists thought of that as well. So much variety! And between you and me, some of the perfumes I tested in the store could be total dupes for some of the industry's most famous perfumes. And did I mention the affordable price point and ways to apply? You've got your choice of a classic perfume, body spray, or rollerball, depending on your needs. Personally, I NEED all three. Will I ever completely give up my designer scents? Probably not. But I'll tell you what: Good Chemistry smells good to me! Find the entire collection here! There are actually no words for how much I love homemade ice cream. Like, it's the most magical experience from boiling the cream to scooping it into the bowl. I love everything about it, and it has completely ruined store-bought ice cream forever. Every year for my birthday (and also, you know, when I feel like I need it), I buy myself a present. For year 24 (which feels like thousands of years ago, by the way), I decided to take the plunge and give myself an ice cream maker. Two days later my lil guy arrived on the doorstep, and we've been happily in love, making ice cream ever since. Every summer I've managed to take on at least two ice cream projects before the leaves start turning and the fall scarves come out of storage (omg just typing this makes me want to get to fall so badly...), but I've always just found recipes in books or on the internet to try. This summer, I realized that I could just as easily start developing my own recipes for a dairy cream dream. So I started to think about the types of things I enjoy: quirky flavors, varying textures, and a great mouthfeel. Oh, and if i can throw jam (my favorite thing) in the mix, well then, we're doing well. SO, Roasted Strawberry Cheesecake Ice Cream was born! Have you ever roasted strawberries in the oven? If not, YOU ARE MISSING OUT, MY FRIEND. My mind is blown; I've been making jam on the stove when I could've just thrown my strawberries in the oven this whole time. Here's the difference between the stove and the oven: in the oven, you can get a nice, consistent, even heat that gets into those strawberries and gives them that warm, slightly smoky flavor that only hot, hot heat can give them. Roasting your strawberries gives them a more concentrated flavor, and warmth and depth of sweetness that you just can't get any other way. I'm telling ya, it's completely changed the way I'm making jam from now on. My favorite part about this ice cream is the creaminess, which absolutely comes from the cream cheese found in the ice cream base. I was very conscious about how I wanted this ice cream to be presented in the mouth. I wanted the dairy to hit the tongue first, then the sweetness of the jam, then finally the wonderful crunchiness and slight saltiness of the graham cracker found both in the ice cream, and as a sprinkling on top, which cuts through some of the sweetness and balances everything out. Did I eat the majority of this ice cream over the span of a week all by myself? Yes. Mission accomplished. Combine sugar and strawberries in a 13 x 9 baking dish. Add vanilla and lime juice, then toss to combine. Roast berries, stirring every ten minutes until the fruit has completely broken down, and the liquid is thick. (Tip: Do the line test. Place the spoon in the jam, then take it out. Try to make a line right down the center of the juice on the spoon. If a clear line can be defined and none of the other liquid on the spoon runs off, your jam is thickened. KEEP A CLOSE EYE ON YOUR JAM ONCE IT HAS PASSED THE LINE TEST; if left unattended it will go from perfectly roasted to burnt. ) This process can take anywhere from 35-90 minutes depending on your oven. (For me, the sweet spot was 75 minutes). Once it has cooled slightly, transfer jam to a jar or storage container. Let jam cool completely in the refrigerator at least two hours or overnight. Pulse graham crackers, butter, sugar, and salt in a food processor until well combined and very fine. Set aside. In a small bowl, stir together 1/4 cup milk and the corn starch, set aside. Place cream cheese in a medium bowl and set aside. In a 4 qt saucepan, whisk the remaining milk, cream, sugar, corn syrup, and salt together; bring milk mixture to a boil over medium-high heat. Once your milk mixture is boiling, cook for 4 minutes, then stir in the milk and cornstarch mixture. Return milk mixture to a boil and cook for about two minutes, until the mixture has thickened slightly. Take off the heat. In the bowl with your cream cheese, pour 1/4 cup of your hot milk mixture that has been strained using a fine mesh sieve, Quickly whisk until smooth. Then, whisk in the remaining hot milk mixture that has also been strained using a fine mesh sieve. Pour mixture into a gallon plastic bag and seal it. Submerge the bag in a bowl of ice water until chilled; about 10-15 minutes. Pour mixture into the bowl of an ice cream maker, then process according to the manufacturer’s instructions. Once your ice cream is ready, gather together your graham cracker topping, and your roasted strawberry jam. Starting with your ice cream first, layer the ice cream, graham cracker topping, and jam in a storage container (I used a nonreactive metal loaf pan). Add a layer of ice cream first, then spoon in some jam. Place ice cream on top, then sprinkle in some graham cracker, then spoon in more ice cream, etc. Do this until you have run out of ice cream. (Tip: Use discretion; if you want more jam, add more jam. If you want more topping, add more topping. The amount you use is totally up to you!) When ready, cover your storage container with either its lid, or a sheet of plastic wrap then place in the freezer until its is completed frozen; about 3 hours. For an extra depth of texture, sprinkle some of the remaining graham cracker topping over the ice cream, then serve. DO AHEAD: Jam and graham cracker topping can be made at least a day ahead. Store both in the refrigerator until ready to use. If you're an aspiring author like me, then you're constantly grappling with what to write and how to write it. It's a daily struggle for me, a person who knows she wants to write, but doesn't know where to start. Enter: The Very Short Story Starter. I stumbled across this workbook of sorts one day while perusing the university bookstore for as many pieces of varying writing styles and subjects as I could. I had magazines, literary journals, and a memoir or two all in my possession at one point or another when I wandered over to the "Writing and Publishing" section. There I found this book, unlike any I'd seen before, just filled to the brim with creative writing prompts with unique starters, and limits. If the prompt says keep it to 500 words, you need to figure out a way to make that happen. If there's one thing I know about myself, it's that I often struggle with brevity, with getting to the point as quickly and effectively as possible. As I thumbed through to land on prompts such as "Imagine you are on a train or at a train station when a murder takes place" and "Go to a local coffee shop, order your favorite drink, and write a story inspired by an incident in a coffee shop before you finish your drink" I knew it was coming home with me. NOW, let's talk about the book's effectiveness. This is not necessarily a quick activity book. While you are prompted to write short works of prose, the assignments you choose are meant to make you sit down and write. And that's a good thing. Many of the prompts provided are entertaining and thought provoking, and really help to get the creative juices flowing. And if you're worried about whether or not this book may lean heavily on the side of fiction or non-fiction, rest assured that there are plenty of prompts that can benefit anyone. My advice? Write in pencil. You never know how very small a number 500 is until you're writing in pen and getting dangerously close to 430 with no story ending in sight. The good: This book offers an enriching opportunity to hone your writing skills and think creatively. If you're struggling to get started in the world of writing, or just want to jump-start a stagnant writing project or two, this book does wonders to get your brain back in the proper mindset. The bad: While the book's introduction section does go into detail about why flash fiction has started to gain in popularity (we live in a busy world, and people like short reads they can easily digest on their daily commute, or on a park bench while sipping a latte), the book sort of throws you right into the deep end without easing you in with some simpler prompts to get you ready. Bottom Line I've thoroughly enjoyed this book so far. It's forced me to put down my phone, turn off the television, and just write. Some prompts have been more compelling to follow-through on than others, but overall, it's done exactly what it has promised: get me problem-solving my writing projects in a way that makes me feel creative and productive. All my aspiring writers should TOTALLY take advantage of Gillard's fantastic resource. You can buy The Very Short Story Starter: 101 Flash Fiction Prompts by John Gillard HERE. Hi, hello, welcome. Today I'd like to introduce you to the only dress you'll need this Independence Day. As you well know by now, I am very partial to a good print, as well as the color red, so when I saw this lil number hanging up on a rack at J.Crew, I knew it was going home with me. As a lady with an ethnic body type, dresses can sometimes be a little hit or miss; what fits in the bust may not fit in the back, but from the moment I zipped this dress up, it just fit in all the right places like a golden glove. I needed more summer dresses in my life! To keep this outfit on the more casual side, I decided to pair it with a nice jean jacket (is it even the 4th of July if there's no denim?? ), a straw hat, some of my favorite block-heel sandals, and a black bag to match. What's nice about this dress is that it can easily go from day-to-night (say, if you're attending a party later in the evening) in a snap: just ditch the jacket and hat, but keep the black bag and heels. Voila! We did it! What are YOU wearing for the 4th of July Weekend? Sound off in the comments below! 1. If someone wants to talk to you, they will find a way. Don't sit around waiting for a text that may never come. Live your life. 2. Take people at their word. If they say they're not ready for commitment, or kids, or anything else, believe them. 3. Never stop trying to improve yourself. Learning new things is the best and should never be taken for granted. It doesn't matter how "nerdy" it is. Learn about it. Do it for you. 4. Try to sit down and think about how you would want to be remembered. Live that life right now. 5. Only show up for people who show up for you. If you don't respect your time, no one else will either. 6. Give second chances. People screw up (including you). But if it happens a third time, take the message they're trying to send. 7. DO NOT compare your life to others because it will only drive you mad. Be happy for their successes and know that you're going to get some success of your own. 9. Don't play games. Put yourself out there and hope for the best. The worst they can do is not reciprocate, and that's fine, too. You'll get your answer and the ability to keep it moving. 10. Just because a person is older than you does not mean they're wiser. 11. Just because a person is younger than you does not mean they can't add something to your life. 12. You may get a thousand "no's" and that's okay. When you get that "yes" you'll appreciate it even more. 13. Some people can go through life flying by the seat of their pants and succeed, but that's not for everyone. Don't be jealous, you do you. 14. Call your grandparents just to say "hi" before it's too late. 15. Don't find someone to complete you, find someone who makes you want to be better. 16. If you want to go back to school and you have the means, for heaven's sake, do it. Don't think, just do it. 17. Speak up more often. 18. Learn to play an instrument. Learn to sew. Learn to cook. Write that book. Do something. Do anything. 20. Your screw-up is NOT the end of the world, even if it feels like it in the moment. You'll get over it I promise. 21. You are NOT too much. You are NOT a lot. You are enough. 22. Mourning a relationship that could've been is real. Feel your feelings. Feel them. 23. Stay close with your family, and don't just show up when you need something. They're always on your team. 24. Keep a journal. Even if you don't write in it every day, or even every month, you'll be happy one day to see just how far you've come. 25. WHO CARES if that song or movie or tv show or book is "embarrassing"? Do you like it? Then enjoy it. You like what you like, and that's that. 26. Sometimes being impulsive leads to some pretty stellar pay-offs...and sometimes it doesn't. You have to be ready for either outcome. 27. It's fine if you cry, and it's fine if you don't. Whatever you do, make sure it's a healthy way to express yourself. 28. When someone gives you the gifts of trust and vulnerability, do everything in your power not to squander them. It is an honor and a privilege to make someone feel safe. 29. Friendships ebb and flow, and sometimes they end altogether. Someone who was your best friend a year ago may one day be an almost-stranger. That's okay. People grow, and sometimes not in the same direction. If you love each other, you'll find a way to make it work. If not, wish them the best and keep the happy memories tucked away somewhere safe. 30. Be proud of where you came from, and don't let anyone knock it. It's a place that made you who you are. To forget your roots is to forget yourself. 31. If you say you are going to be somewhere, be there. Keep your commitments as often as you can. 32. You may not know who you are yet, and you may never fully, but don't rush the process. Be okay with the slow-burning reveal. You'll be happy you did. As I write this I should be working on like...at least three other assignments for work and school. This semester has been a BUSY ONE, and I feel like I've spent the bulk of it just playing catch up. And while all the late nights and early mornings have been totally worth it, sometimes I just want to kick back, take a break, and make some cookies. Well, kick back, take a break, make some cookies, and ALSO watch the 10+ shows with 2.5 episodes each that have collected on my DVR list. Can we talk about being busy for a second? It's kind of a blessing and a curse, isn't it? On the one hand, I certainly remember a time when I had nothing BUT time; I had one idea of where I wanted to go career-wise, and I would get so close, but no dice. Then I would cry (we're getting real today) and wonder why I couldn't get the same opportunities that other people were getting, even though I wanted them. It's only now, several years later, that I've started to think about why I wasn't getting those opportunities. Plainly, it was because they were not meant for me. See, I understand now that that wasn't where I was supposed to go in life. If I had done some of those things then I would never have gotten to come back to the east coast, I would have never gone back to school, and i would never have been open to the opportunities that I have now. And going forward, I understand that I'm just not meant to have everything that's coming my way, and I must, MUST be okay with that. Because ultimately, it means that somewhere down the line the things that I'm supposed to do will be there waiting for me. So even when I feel like I can barely keep my eyes open, and that I haven't had much of a social life in months, I never let myself complain about it. Because Heaven knows I know what it's like to not be busy. LOL OK, let's talk about cookies now. As you may well know, baking for people is my move. I have won hearts, made friends, and mended fences through the power of baking. I recently started a job that I really like, in a field that I really love, and as soon as the time was right, I decided to fire up the oven and feed the people who I would one day like to call new friends. And what is the main component of any office setting? Coffee of course! But I had a bit of a problem: most of my go-to coffee-flavored desserts were designed to be eaten immediately, and I was looking at a "make overnight, travel by train, and serve mid-morning the next day" type of situation. Whatever I made had to travel well and improve with time. On top of that, I was faced with the added challenge of two counts of tree nut allergies! Luckily, Dorie Greenspan had my back in the form of a recipe her in cookbook Dorie's Cookies, and together she and I (meaning me, talking to pages of a cookbook) decided that the coffee-malt cookies I had bookmarked would totally fit the bill. Here's a fun story: this recipe calls for "malted milk powder." In the recipe introduction Dorie assures the reader that malted milk powder is a common household ingredient and that it should be in any grocery store. I'd never seen it before, but of course, that didn't mean that the local Stop & Shop, with its shelves jam-packed with foods wouldn't carry it, right? Right. So off I went with no real contingency plan if I couldn't find the key ingredient in cookies that I absolutely had to get right (and also show UP with since I'd had to notify people ahead of time that cookies were due to arrive to their stations first thing Monday morning). Up and down and up and down the baking aisle I went, frantically scanning each shelf, picking things up, and putting them back. Absolutely nowhere did I find the malted milk powder. I found MILK POWDER, and hoped and prayed that they were the same but alas, they were not. Eventually I flagged someone down. Perhaps he could sense my desperation (mixed with frustration) and ran off to be my hero and find the malted milk powder. And at last! He ushered me to the COFFEE AND TEA AISLE (of all places) where the malted milk powder was actually OVALTINE. Back on track, I thanked him and was on my way. These cookies are insanely easy to make. You're basically just throwing all the ingredients together and mixing; definitely my kind of recipe when I'm in a hurry. The edges are crispy, but the cookies are nice and chewy in the center. The espresso flavor is strong with a subtle hit of vanilla from the Ovaltine. One nice thing about coffee-flavored desserts is that you can almost (I said ALMOST) pass them off as a breakfast item. Which, I'd like to add, is kind of what these ended up being since I couldn't stop myself from racing over to serve them first thing at 9:00 am. And how did it go, you ask? At the end of the day my ten cookies turned into two, and I got lots of appreciative smiles. Baked goods work every time. Position the racks in your oven into thirds and preheat it to 350 degrees F. Line two cookie sheets with parchment paper; set aside. In a small bowl, whisk together the flour, Ovaltine, and baking powder. Set aside. Using a stand mixer with the paddle tool attached (or a hand mixer, or a wooden spoon), beat the butter, sugars, ground coffee, and salt together on medium speed until well-mixed. If any of the mixture has made its way to the sides of the bowl, scrape it down using a rubber spatula. Return the mixer to medium speed and add the egg and egg yolk one at a time, making sure each addition has been mixed in well before adding the next. Beat in the vanilla. Now it's time to add the dry ingredients. Make sure the mixer is off, then add the dry ingredients all at once, and set the mixer to low. Keep an eagle eye on it; you don't want to over-mix. Wait until the dry ingredients have been completely into the dough, then shut off the mixer. To make sure your dough is well put-together, give it a few turns in the bowl using a rubber spatula. Using a cookie scoop or a teaspoon measuring spoon, scoop out and level portions of the dough. Roll out the dough into balls using the palms of your hands, then place the balls an inch apart on the lined cookie sheets. Bake the cookies for 14 minutes, rotating the cookie sheets from top to bottom rack and from front to back at the halfway mark. These are the type of cookies that continue to firm up outside of the oven, so don't be alarmed if only the edges are brown and the cookies look undone. Transfer the cookie sheets to wire racks to cool for about ten minutes before lifting them off the sheets and letting them rest on the racks until they are completely cool. To store: These cookies can be kept in airtight containers for up to 3 days. Winter has been kind of long, you guys. Normally, I love the cold weather, but I've been sick twice, and now I'm ready for spriiiiiiiiiing. But it hasn't been all bad: I've purposefully chosen to surround myself with some pretty things here and there, enrich my mind with some books that I really want to read (to counter all the books I have to read for class), and make a little time for my beloved television. I start my mornings VERY early these days. To get over getting up before the sun, I need my trusty travel mug of green tea. And while any vessel would do (so long as my tea stays piping hot), I find that the commute is just more fun when lounging walruses are around. If you're new to S'ip by Swell bottles, allow me to introduce you to your new favorite way to consume temperature-sensitive beverages. S'Well is just a company that I very much enjoy for their focus not only on eye-catching patterns, but their promise of keeping drinks hot and cold respectively. AND THEY DO. My commute is two hours, and in those two hours, not a single degree changes from the time the tea is made to the time I'm being squeezed against a seat by a person with poor spatial reasoning, but determination to force themselves into a teeny two-person seat. I live for a fun pattern. My only gripe is that these travel mugs work almost too well: my first trip ended in a severely burned tongue. From that point on, exactly three ice cubes make their way into that boiling hot leaf-water as soon as it's steeped. Life is just one big collection of important papers, isn't it? Syllabi, to-do lists, receipts, everything. And because I have a minor panic attack when I can't find a post-it note with nothing on it but the word "lunch" even though I can SEE the lunch in front of me and am unlikely to forget it, I desperately need my papers to all be in one place. But just because I need to stay organized does NOT mean that my office supplies have to be boring. As you'll soon learn, I am never one to turn down a good print. And when I found this SUPER CUTE accordion folder on Amazon (at such a good price), I threw it in the proverbial cart. And so far so good: every time I snap the little button in place, I silently congratulate myself on being a good adult who has access to all her documents. Yes, target marketing works on me. I see Glossier videos every single day of my life on social media. EVERY DAY. And because I am a sucker for minimalist packaging with a pop of color, make-up videos, and persuasive positive reviews, I finally, FINALLY caved and bought two tubes of the utterly popular Cloud Paint. My thoughts? I WILL VERY LIKELY NEVER GO BACK TO PRESSED BLUSH AGAIN. I love these blushes. I love them. Just as the name describes, the teensiest dot of this gel-based blush feels like you're painting your cheeks with ultra-light paint; leaving this subtle, BEAUTIFUL tint to your cheeks. While the tubes look small, I reckon these will last for months because honestly, a little goes a long way. I bought "Pufff" and "Beam" and I use them interchangeably. Get some. Oh, are you surprised that I own more than one of these S'ip by S'Well bottles? You know I only enjoy my beverages out of novelty vessels!! This one is in the print "Crab Walk" and it has SEEN some things. I have banged it, dropped it, and scratched it, and my lil buddy is still going strong, keeping my ice water icy for hours and hours. Totally worth it. This list would not be complete without a cookbook because my obsession has not waned, not even one bit. If you're a part of the food world, then you have seen Alison Roman's book everywhere; and for good reason. She is amazing, and this book is just an awesome extension of the talented former Senior Food Editor of Bon Appetit. Alison is like that cool teacher who wants you to learn, but doesn't pressure you or push you before you're ready, and adds a little humor while she's at it. I have been learning to cook from her for years now, and I can already tell I will be reaching for this book over and over again. This book passed the test, and is now resting comfortably on prime real estate on Sydney's bookshelf. Expect a fuller review in the coming weeks! There are twp things I love: PRINTS, and pouches. I have many, many of them, and they're all being put to very good use. There's something else I love: finding new stores on Etsy to fawn all over! When I saw this GORGEOUS print from Flowiestyle. I added it to the cart. I think I'm going to make this lil guy my travel snack bag. I think I got two paragraphs into Exit West before I was absolutely hooked. Mohsin Hamid is a poet, a true poet. Every line is romantic and captivating and unique. If you love romance novels with a twist, you'll love this book. PLEAAASSEEEEEE tell me you're watching The Olympics, guys! I know, I know, the summer games are decidedly more exciting, but DANG do I LIVE for the competition. Particular favorites: figure skating, snowboarding, and SKI JUMPING! Everyone goes so fast, so high!! I lose my MIND every four years without fail. What are some of YOUR winter favorites? I don't know about you, but I am a snack person. I snack. BIG TIME. I guess I should be thankful that I have a pretty fast metabolism, but that isn't always so helpful when I've found myself on the train completely unprepared with five loooong stops to go before I get to my destination. Hangry Sydney is not a side that I like for people to see, so I've been more conscious this year about planning accordingly, snack-wise. The year is 2018, and this girl is on a mission to only consume healthy(ish) snacks. They've gotta taste good, but they also need to make me feel good after I've stuffed my face, ya know? And if they have chocolate, well, that's an added bonus. If you're a person who enjoys putting your peanut butter cups in the freezer for a little bit of crunch, followed by the slow-building sweetness of peanut butter balanced with semi-sweet chocolate, then these energy bites are for you. The chocolate and peanut butter levels are abundant in these lil' bites, and the temperature is nice and cool, so that's the part that tastes good. Now here's for the part that makes you feel good: the added bonus of oats, CHIA SEEDS (my new fave thing!!! ), ground flaxseed, and a nice hint of sea salt. Sea salt, I've always believed, is really chocolate's one true love. I make sure to honor that special bond as often as I can. These chocolate and peanut butter bites are positively PERFECT for when you need a super quick snack, or a nibble of something sweet. They'll taste good, look good, and make you FEEL good. Line one cookie sheet with parchment paper. Set aside. In a large bowl, whisk together the honey and peanut butter until well combined. Fold in the oat mixture with a rubber spatula and mix until all ingredients are well combined. Using a cookie dough scoop, or a 1 tablespoon measuring spoon, scoop up 1-inch balls. Gently roll each ball between the palms of your hands until perfectly round. Place finished balls in rows on the cookie sheet until all the balls have been formed. To store: Chocolate and Peanut Butter Energy Bites can be stored in the refrigerator in an airtight container for up to one week. We got a LOT of snow last weekend. A LOT. Luckily, I had nowhere to go, a ton of time on my hands, and a hankering for some cheesy biscuits. Let me preface this post by saying: I belong to a biscuit family. We are biscuit people. We love them so much that there is an active, unspoken rivalry over who makes the best biscuits (spoiler: it's my grandmother. But the battle is contentious for the number two spot). It's brutal. I have to say though: as much as we love a good biscuit, my entire family is guilty of whipping up the same plain jane (but totally buttery, utterly delicious) ones every time. We're very much "if it ain't broke, don't fix it" people. But listen, after 20+ years on this here planet Earth, I needed to venture out. Be my own woman. Put cheese in a biscuit. You know, real "take charge" kind of stuff. And what better time to spin a classic than when the snow outside is ankle-deep and mocking you for all of your cancelled plans? Coming from a land where dairy is a mandatory diet requirement, I have never been one to shy away from all things butter and cheese. Luckily, these biscuits are skimping on neither. From their crispy tops and bottoms, to their pillowy-soft and cheesy centers, dairy is very well represented. But what takes these biscuits to the next level (and what prevents them from being otherwise one-dimensional) is the addition of heaping 1/2 teaspoon of garlic powder. And by "heaping" I mean: don't you dare level the mound of garlic powder scooped up with your measuring spoon. Let it flow, let it go. What you get is the crispyness of the sharp white chedder cheese (made even better by a slight darkening in the oven) mixed with the aromatic presence of garlic. Both flavors are big fans of one another, and let each other share the spotlight. These biscuits are so good that I didn't even need to use butter. They were THAT good on their own. Oh, and if you've got a biscuit cutter on the smaller side (hi, you're not alone) and end up with the number of biscuits more suitable for a party rather than 1-2 people, just put these bad boys in an airtight container and store on the counter top for about a week. When you're ready to chow down, these spring beautifully back to life in the oven. Set it to 350 F and pop them in for 5-10 minutes. Good as new, and buttery-garlicky-cheesy as ever. Snowy/Rainy/Any day approved. Preheat your oven to 425 degrees F. Line two baking sheets with parchment paper and set aside. In a large bowl, whisk the flour, salt, garlic powder, and baking powder together until well incorporated. Using a fork, pastry blender, or your fingers, cut in the very cold unsalted butter cubes into the flour mixture until all the butter has been cut in, and the mixture has pea-sized pieces throughout. Next, stir in the white cheddar cheese until well incorporated. Create a well in the middle of the flour mixture, and pour in the milk. Gently stir until a shaggy dough has formed. Use your hands to finish bringing the dough together, making sure to incorporate the dry bits of dough. Be very gentle and work quickly. On a clean, lightly floured surface turn out the dough and gently fold it in on itself a couple times just to make sure that the dough is solidly together. Be careful not to over-knead. Once you are confident that the dough has come together, gently pat it out into a disk that is roughly 1/2-inch thick. Flour your biscuit cutter, then cut out your biscuits and place them on the parchment-lined baking sheets. GENTLY re-roll the scraps and repeat the process until you have run out of dough. Using a pastry brush, brush the three tablespoons of melted butter evenly over all of your biscuits. Bake for 10 to 12 minutes, or until the tops are lightly golden. If you have a hotter oven, make sure to check at the 10-minute mark because these biscuits bake quickly! When your biscuits have baked, let them cool on their baking sheets for at least ten minutes, then serve. To store: Biscuits will last for about a week if kept in an airtight container. Just before serving, pop them in a 350 degree F oven for 5-10 minutes. This will revive them. © Sydney Manning, Seasoned with Sydney, 2012-2018. Unauthorized use and/or duplication of this material without express and written permission from this blog’s author and/or owner is strictly prohibited. Excerpts and links may be used, provided that full and clear credit is given to Seasoned with Sydney with appropriate and specific direction to the original content.